Better Reading Strategies Workshop | Save My Reading Life! “Good” reading is really just a process. It’s a process that “naturally” good readers may not even know they do. The first step in this process is thinking about how to read material. Good readers choose not only what to read but also how to read the material. Good readers read different materials is different ways. Take, for example, the difference between reading your Facebook news feed and reading instructions from your boss. You most likely read your Facebook news feed quickly and superficially, glossing your eyes over the page and only “reading” those stories that you find of most interest. You do not “read” your entire news feed. In contrast, instructions from your boss on how to complete a project you probably read slowly and thoroughly. You might even read the instructions several times, maybe even taking notes as you go so you do not forget anything. This difference in your style of reading is an important part of being a good reader. Slide 2: Active vs. Passive Reading Many students are told that they should be reading “actively.” How does one read actively? Since we can probably figure that it does not mean exercise while reading, then what must one do? Let’s take a look at active activities and passive activities. Passive activities are those that do not demand work or thought from the participant. An example is watching television: watching a show on television requires no active, critical thinking, or questioning from the viewer. You do not have to challenge what you are viewing, and often it’s expected that you don’t (though, sometimes, you probably should). Passive activities allow you to simply be there for the activity: you’re not involved. Active activities are those that demand work or thought from the participant. One example that often comes to mind is playing sports. While playing sports are physically active, they are also mentally active. Take the example of the quarterback on the American football field. He is most often the least physically active player on the field, but he is just as “active” because he must mentally “map” and “plan” where his team is, and coordinate with them to complete the play. Another example of a very active activity is playing the game of Chess. While Chess players do not “look” active like athletes do on the field, they are mentally planning their moves and predicting the moves of their opponent. Chess is a very active activity. To actively read one must always be thinking. Reading is, and should be, thinking. Interact: Treat reading like you would a conversation. If you were in a conversation with another person you would agree, disagree, get upset, or be intrigued; you may want to cry, laugh, or even ask questions to understand the conversation better. If you simply sat there ignoring a person who was talking to you by not reacting at all, the person who was talking to you would be very offended. Interact with the text like a conversation: agree, disagree, sigh, visualize, ask questions and be involved with the information. Interacting is asking questions and paraphrasing. Evaluate: Not everything in every book is true. Some books are dated, others may have extreme bias, and other may just be giving an opinion. Every time you read a text, ask yourself “is this information correct? Does it reflect what I know about the world? Why or why not?” It’s OK to disagree with another person’s opinion and if you find wrong information in your textbook be sure to bring it to your instructor’s attention. If nothing else, if what is in the book is contrary to your own experiences, ask your teacher for clarification. Apply: Constantly compare the new information the text is giving you to the information, experiences, and ideas that you’re already familiar with. When you finish reading, look for examples and experiences that are explained by the information in your text. By linking this new information to your schema, or prior knowledge and experiences, you’re actually making it more likely you’ll remember the information long-term. Application is also finding ways to remember the information such as making an outline, a map, or flashcards to remind you of important ideas, relationships, or terminology. The more ways you find to apply the information the more likely you are to remember it. Annotation is one of the most powerful tools students can use in college and at work. It is a way for students to unlock not just the meaning of texts, but also the “between the lines,” or inferential, meanings, and be able to remember it all long-term. If, for some reason you are apprehensive about writing in your book, please read this post on the Myths of Writing in Books. It will offer advice on making this decision, as well as alternatives to writing “in” the book. 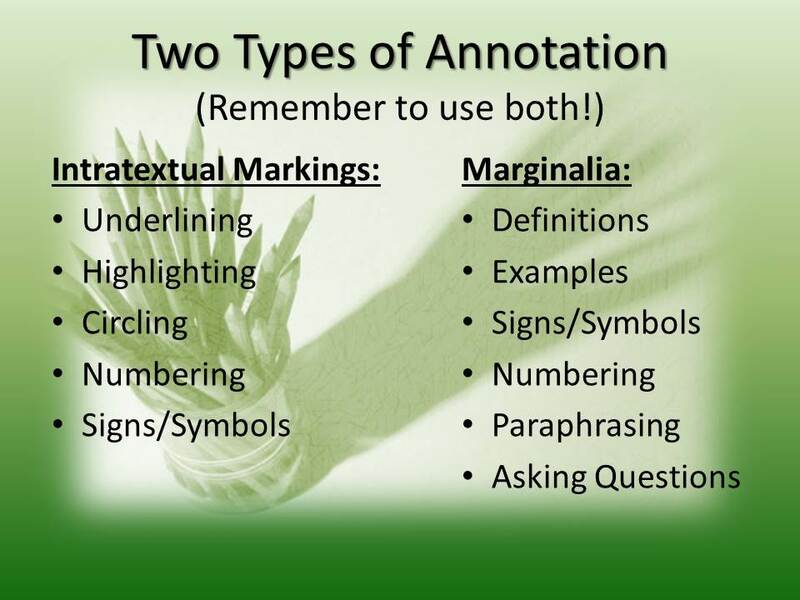 Slide 4: Two Types of Annotation – Remember to use both! You’re probably wondering what this “annotation” business is. Annotation is a process of marking a piece of text while reading. It involves two parts: intratextual markings and marginal notes. Intratextual Markings are marks done to the author’s words on the page. The most common kind of intratextual notes are highlighting words or phrases on the page. However, intratextual markings also include underlining, highlighting, circling, numbering, and signs/symbols. Marginal Notes (or Marginalia) are notes written in the margins of the text. They can include short paraphrases of definitions or examples from the text, signs or symbols to mark important passages, creating numbered lists, and asking questions. To annotate effectively you must use both. 1. Survey – Surveying, or previewing, means looking over the text you must read to see what is in store for you. To survey, look over the learning objectives, any headings and subheadings, glossary terms, and pictures and graphics. Your goal is to get an idea of what’s in the text so you know how much time to spend reading and how easy or hard the text might be. 2. Determine Purpose – After surveying the text, determine why you are reading and what you need to get out of it. Are you familiar with the topic? Is it reviewed material or new material? Why do you have to read it: is it part of required reading for a course, extra reading assigned outside the textbook, or research for a paper you must write? Must you take a quiz on the material, participate with a class discussion, or know it for a midterm or final? Your purpose will help you know how to read it, and will help you find what’s most important. Information your instructor mentioned in class. Information in the text that you don’t understand. Information in the text that is new, important, or that you find interesting. As you read, every time you’re tempted to highlight or underline anything ask yourself the question “why do I want to highlight/underline this?” Is it an important definition, a helpful example, something mentioned by your instructor, or information that helps you understand better? Whatever your answer, that’s what you write in the margin to help you remember why that highlighted/underlined bit of information is important. Don’t forget skip pictures and graphics while reading. The information provided usually ties together (visually) the ideas within the surrounding paragraphs. Look at the caption(s) and read carefully. Make sense of the graphic with the information provided. Ask questions: what is the relationship(s) between the information? Why did the author put this graphic/picture here? How might this information be important to my class? What am I supposed to learn? Write your questions and any answers you may have near the graphic. 5. Ask Questions – The final, and often most important step, is to ask questions. There are two types of questions you’ll want to ask while you read. The first type of questions are the kind you ask to help understand the text. When you come to something you don’t understand, slow down and read it again carefully. You may have to read a few times to understand a paragraph or section. If you’re still confused, then write questions in the margin: the more detailed the better. A question like “will you explain chapter 3?” will be less effective when you ask your teacher than a question like “On page 75, can you please explain how the process works in the third paragraph on the page?” These planned, detailed questions will also signal to your teacher you at least attempted to read, and make sense of, the material. The second type of questions will help you find the “important” information in the text. One strategy you can use is to turn headings and/or subheadings into questions. For example, a heading from a biology textbook might be “The Chemical Context of Life.” This heading could be turned into questions like What are the chemicals that make up life? What is the role of chemicals in life? Using these questions, you can now look for answers to help you locate the important information in the chapter. 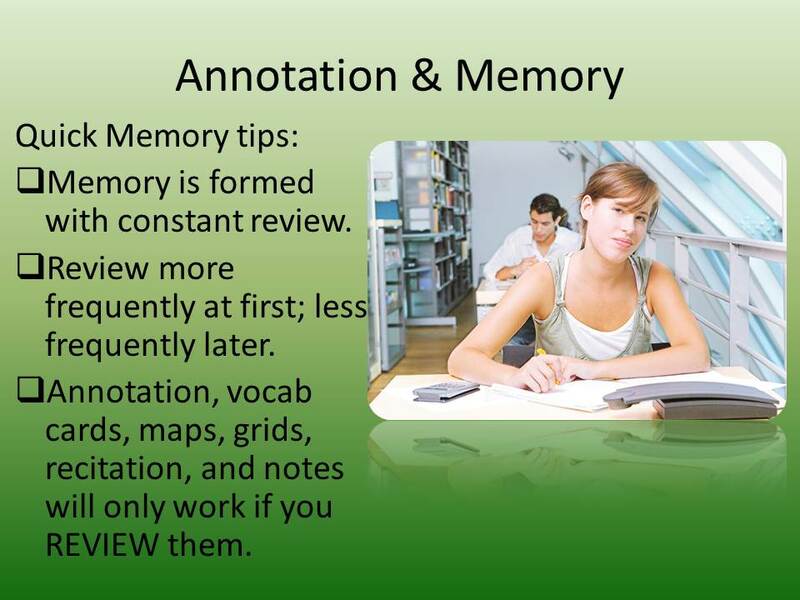 Slide 6: Annotation and Memory One common complaint students have is that they cannot remember what they read. While there are neurological disorders that might cause memory problems, they are fairly rare. However, if you feel that you have a significant memory problem, I encourage you to be tested by a doctor and seeking academic help through specialized learning services; memory problems do not have to hold you back from academic success. If you’ve not been diagnosed with a memory problem, then most memory deficiencies are due to lack of preparation or lack of consistent review. The beauty of annotation is that it can help with both of these problems. Interacting and writing in the text can help you to remember what’s in it, but also help you locate where to find things you may need/want to find later. By writing down, paraphrasing, marking, and noting where items are in a text, you can make it easier for you to go back and review the information in the text. This will help along the transition from short-term to long term memory. 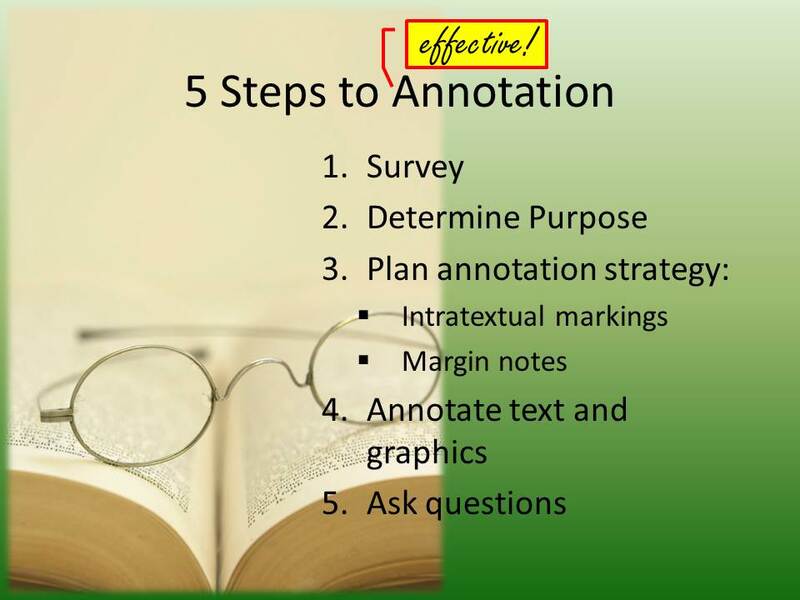 Annotation can make reviewing easy, fast, and effective. Once annotated, you can go over only the annotations, using your highlighted/underlined phrases and marginal notes to zero in on the most important parts of the text, and review only those parts. Students often complain that they don’t have time to “review.” These students are often confusing “review” with “rereading.” Reviewing is not rereading. Rereading means you read the whole text, in its entirety, again and again. If it took an hour to read it the first time, it will take another hour to reread it, and another hour to reread it again. Reviewing, on the other hand, it briefly looking over the most important parts of the text. If it took you an hour to read and annotate a text, it may take you only twenty minutes to review it. If you spent 3 hours over 3 weeks (one hour per week), you could review 3 times a week (in 20 minute sessions), and get more out of the text than you would if you reread it 3 times. * Memory is formed by constant review of information. When you learn something new, you cannot, and should not, expect to remember it if you don’t take the time to review it, and review it often. * Constant review is key to long-term memory. The best way to learn information and be able to remember it, is to review more frequently when the information is new and less frequently as it becomes more familiar. * Things like annotation, mapping, grids, vocabulary cards, recitation, and good lecture notes are great, but do not work unless you continue to review them frequently. Pingback: The Lecture Note Taking Workshop | Save My Reading Life!